Answer: Amy, a complete front and backyard makeover may be exactly the remedy. 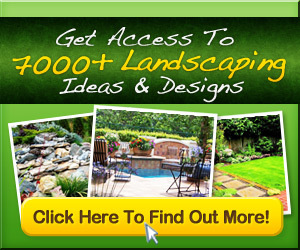 It really comes down to landscape planning and design. In my opinion, pruning or ripping out is not the right approach or option. When you moved into your “new” home I’m sure you made some changes to floor covering – carpet or wood, paint, window treatments and even lighting fixtures. You started with some type of plan or design. The same holds true for your landscape. However, old landscape plantings that have been incorrectly made should be managed differently, depending upon how seriously out-of-line they have become or will become in a few years. Shrubs that are only slightly large for their positions may be modified in size by removing some of the older branches at the base. If, however, any of the shrubs, whether evergreen or deciduous, are decidedly too large for their positions, it is best to remove them. A plant of this kind that is still well-shaped and in good condition may be transplanted to a more suitable position, such as the corner of a building, a large wall space, or a border planting. If the plant, particularly if it is an evergreen, is not in good condition, it is best to discard it. Any old, deciduous, ill-shaped shrubs can usually be brought back to well-shaped condition by cutting them back severely. This forces new shoots to come up from the base. A new and lower growing plant should replace the tall one. Tall-growing trees in the foundation planting. A straight row of one variety of plant around the house. Tall-growing shrubs in front of windows. They darken the room and block the view toward the outside. Too great a variety of plants. Plants with brightly colored foliage should be used with caution. Only low-growing shrubs underneath windows. Ground covers may be used to advantage or these places may be left unplanted except for extending a lawn to the foundation wall. 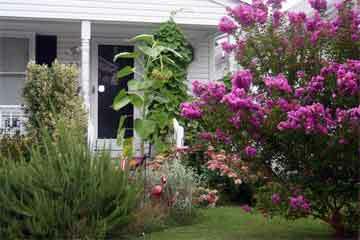 Low-growing shrubs around porches, patios, decks or terrace except where shade is desirable. Part of a large porch may be shaded by a vine or a tree-form shrub. Dwarf to medium-sized plants at the sides of small entrances and steps. This shrub planting sometimes may be supplemented by planting a vine that may be supported at the side of a doorway. This type of entrance planting usually is better than a narrow, upright evergreen placed at each side of the doorway. Medium to tall-growing shrubs at the corner of the house except where a driveway or walk is close to the side of a house. Here a vine may be used instead of a tall shrub.